" Call infect to get the bundle handling started.
" *NOTE*: comments after Bundle command are not allowed.. Call infect to get the bundle handling started. 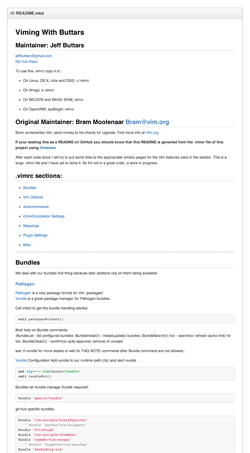 *NOTE*: comments after Bundle command are not allowed..
Vimdown source is on GitHub, along with his own example Vim setup, complete with Vimdown-based README.